“WE LOVE YOU” opens with the burning heart of Scotland at the end of the Torchlight Procession on Holyrood Park, rounds off 30 December with Symphonic Ibiza in McEwan Hall; is delighted to welcome to the 31 December celebrations Compagnie Transe Express, Meute, Snap! and Compagnie Des Quidams with more to be announced; on 1 January, ends the 3 days of celebrations with Carlos Nunez and special guests from the cream of the Scottish music scene; and finally, closes Edinburgh’s Hogmanay with Message from the Skies and six love letters to Europe. Spend the 31st thinking you are seeing double with Street Party Hosts, The Mac Twins. First Footers Family Ceilidh a new, free of charge family Ceilidh on 1st January in McEwan Hall. The iconic Torchlight Procession comes to a blazing finale with youth engagement project #ScotArt: bookending last year’s spectacular visual moment this time marking the end of Scotland’s Year of Young People 2018. The iconic fireworks will once again stun with a specially created soundtrack by German techno-marching band Meute from the ramparts of Edinburgh Castle at midnight on the 31st. Co-commissioned with the Edinburgh International Book Festival, Message from the Skies returns from 1 – 25 January 2019 and asks 6 of Scotland’s leading writers from the fields of poetry, journalism, fiction, travel, history and theatre - Billy Letford, Chitra Ramaswamy, Kapka Kassabova, Louise Welsh, Stef Smith and William Dalrymple - to each write a love letter to Europe. 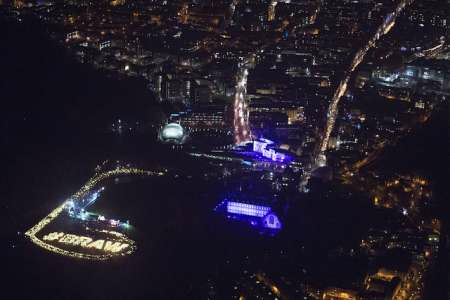 Edinburgh’s Hogmanay 19 builds on the success of last year’s festival with new events, the return of much loved traditions and the continuing evolution of its centrepiece Street Party that keeps the celebration going all evening. The three-day festival opens on 30 December 2018 with the stunning traditional Torchlight Procession which sees a river of light weave its way through the historic heart of the city, down the Royal Mile, around Holyrood Palace and the Scottish Parliament before culminating in a stunning visual moment in Holyrood Park. #ScotArt - Marking the end of Scotland’s Year of Young People 2018, puts young people at the heart of the Torchlight Procession and the opening of Edinburgh’s Hogmanay. A Scotland wide engagement campaign co-designed and led by young people has already kicked off in a quest to create #ScotArt. Bookending #ScotWord, which brought together 2,633 young people last year in a debate about a word which would sum up Scotland to the world and form the fiery finale of the popular Torchlight Procession, Edinburgh’s Hogmanay has recruited young Champions and young emerging artists from across Scotland to co-lead creative workshops of young people from each region to conceive of and design 14 symbols which the young people believe best encapsulate each region. The symbols will then be made in giant wicker sculptures with the help of artist Ariel Killick. These incredible sculptures will be displayed on the Royal Mile from Christmas to 30 December when they will form the focal point of Edinburgh’s Hogmanay Torchlight Procession. The project is supported by the Year of Young People Event Fund and is run by Underbelly in partnership with Young Scot and supported by Edinburgh Art Festival. Marking the end of the Year of Young People 2018, young pipe and drum bands will lead the Torchlight Procession down the Royal Mile into Holyrood Park where the Procession will form the distinctive outline of Scotland lit by their torches. The #ScotArt sculptures then come together to form a heart shape at the centre of this outline of Scotland. As the heart is lit, young people are placed at the country’s beating heart symbolically representing a collective national youth voice, offering symmetry to the #ScotWord project delivered to herald the arrival of 2018 and book-ending the Year of Young People events programme. The magical and much-loved Candlelit Concert in St Giles’ Cathedral returns on the 30th December capturing the splendour of the court of Versailles with Marc-Antoine Charpentier’s Te Deum, famous for its iconic opening fanfare. The Baroque theme continues with J.S.Bach’s cantata for the last Sunday of the year, Gottlob! Nun geht das jahr zu Ende BWV 28, and the concert concludes with festive exuberance in Bach’s Magnificat. The concert will be accompanied by the St Giles' Cathedral Choir, directed by Michael Harris, with the St Giles' Camerata, leader Angus Ramsay, joined by a stunning array of talented young soloists. The spectacular McEwan Hall becomes a new venue for Hogmanay this year, hosting events on both the 30th December and 1st January. On the 30th December, Symphonic Ibiza fuses a live 15 piece orchestra with renowned club DJ Andy Joyce (Cream, Eden, Ministry of Sound, Creamfields) to create a stirring concert of club classics under the amazing dome of McEwan Hall. The show comes off the back of a BBC Radio 1 performance in Ibiza this summer and makes its UK premiere at Edinburgh’s Hogmanay. Kids love fireworks just as much as adults. So, on 31 December, the celebrations kick off early for local and visiting families to have the opportunity to celebrate New Year together in West Princes Street Gardens at Bairns Afore. Massaoke, the live band and singalong sensation that is sweeping the UK from Glastonbury Festival to the Edinburgh Festival Fringe will have everyone dancing and singing their hearts out before a stunning ‘midnight’ fireworks moment at 6pm that gives the young their midnight moment and sets the scene for a spectacular night. Edinburgh’s Hogmanay renews its partnership with One City Trust, donating 50 pence from every ticket sold for the Torchlight Procession to the Trust as the Torchlight Procession Charity Partner. Edinburgh’s Hogmanay will also make 300 free tickets for Bairns Afore available to the Trust to maximize the opportunity for young people around Edinburgh to get involved and celebrate Hogmanay. One City Trust is dedicated to fighting inequality and exclusion in Edinburgh. The Concert in the Gardens at the foot of Castle Rock is at the heart of all the celebrations that night. Scotland’s favourite indie band Franz Ferdinand headlines Edinburgh’s Hogmanay, the biggest New Year celebration in the UK, for the first time, topping off a fantastic year which kicked off with their new album Always Ascending. With some of the most danceable, chantable indie anthems of the last two decades, Alex Kapranos and co. have built a reputation for truly electrifying live shows. One of the most idiosyncratic British acts of recent decades, Metronomy - impossible to pin down and equally as hard not to fall in love with - supports alongside Free Love, the latest manifestation of Scottish duo Suzanne Rodden and Lewis Cook (FKA Happy Meals), and a continuation and progression of their utopian dance pop experiments. The Street Party in a brand-new partnership will be hosted by Johnnie Walker as we walk together into 2019. Scotland is very much the home of Hogmanay and its capital city will once again set the New Year celebration benchmark, showing the world how to party with style, spirit and a warm welcome as the carnival atmosphere takes over Edinburgh’s picturesque city centre from 7:30pm in the best, biggest, longest, and friendliest street party in the world. Johnnie Walker will provide all revelers with a free dram to ring in the New Year and toast 2019 in style, holding true the Scottish tradition of seeing out the old year and in with the new with a wee dram of Scotland’s national drink. From the moment the doors open at 7:30pm, till long after the midnight bells have fallen silent, bands and DJs, street performers and dancers, acrobats, disco divas and fire eaters from Scotland and mainland Europe will all combine to make it the party of a lifetime. Returning to their home city, this year’s Street Party Hosts are Love Island’s Aftersun DJs The Mac Twins. Their task is to keep the party up all night long as the stars of Hogmanay’s own arena TV show, as well as taking a turn on the Castle Street DJ stage. Music is at the heart of the Street Party and Edinburgh’s Hogmanay 19 brings some of the hottest acts of 2018 to new year revelers across three stages. From the home-grown headline phenomenon that is Gerry Cinnamon to the classic Ibiza sounds of Judge Jules and Snap!, there’s a whole continent of good times happening out on the street. Headlining the Waverley Stage is Gerry Cinnamon topping off a whirlwind year of festival appearances, sell-out tours when he blasted onto the scene as one of the best live acts in the UK. Also playing the Waverley Stage are the Edinburgh band with an indie-infused electro-pop sound currently making waves, Vistas and Snap! the German Eurodance outfit whose hits The Power and Rhythm is a Dancer regularly fill dancefloors. Taking to the stage in South St David’s Street is Elephant Sessions, the indie folk foursome from the Highlands who lifted BBC Scotland’s Trad Music Album of the Year in 2017. Acclaimed Edinburgh band Miracle Glass Company brings its vibrant, psychedelic rock ‘n’ roll and Hamburg based Meute will wow the party-goers with its one-of-a-kind, live drum and brass arrangements of well-known techno and house numbers. Headlining the DJ stage in Castle Street is the superstar DJ Judge Jules making his Edinburgh’s Hogmanay debut, taking the audiences up to the midnight moment. Local powerhouse Trendy Wendy kicks off proceedings with her trademark 21 Century disco and the Mac Twins are set to make sure the party turns up a notch after midnight, taking dancers through to 1am. Whether your taste is indie or Europop, Silent Disco has a playlist for you. Don your headphones on Market Street, choose your channel and get ready to learn some groovy new moves this Hogmanay. Last year, the festival asked up-and-coming Scottish band Niteworks to compose the soundtrack for the Midnight Moment fireworks. Continuing this theme and in keeping with this year’s celebration of Europe, Edinburgh’s Hogmanay has commissioned a soundtrack to the fireworks from German band, Meute, who will also perform on the stage on South St. David Street. Meute are working with award-winning composer and sound designer Dan Jones, who will also sound design the Street Party arena. Underbelly has reassembled last year’s fantastic creative team of sound, light, audio visual and production designers to build on the Street Party celebrations on the 31st December. The team is once again led by Martin Green, one of the UK's leading live event producers. Following on last year’s beefing up of the event, this year’s Street Party hosted by Johnnie Walker sees Compagnie Transe Express, a troupe of French performance artistes who will bring their own unique form of anarchic and hugely entertaining street theatre. French company Compagnie Des Quidams will lead a herd of beautiful larger than life glowing white horses to wind their way along the Princes Street. Louise Marshall returns with her all female Diva and Districts Pipes and Drums, aerialists All or Nothing Aerial Dance Theatre animate the skies and after their big hit at last year’s Street Party the Got Soul! Choir return appearing throughout the night to lead the party-goers in song all whilst PyroCeltica dazzle with spectacular show of fire theatre portraying Celtic myths and folklore. Street Party ticket holders will be given the option of making a donation when purchasing a ticket to raise money for Brain Tumour Charity, an organisation Underbelly raises money for year-round, and for which it raised over £30,000 this summer. Brain tumours are the biggest cancer killer for children and adults under 40 and increased funding for research is desperately needed. Around 500 children and young people in the UK are diagnosed each year but diagnosis times of childhood brain tumours are longer in the UK than in many other countries. The Brain Tumour Charity’s HeadSmart campaign aims to reduce brain tumour and brain cancer diagnosis times to four weeks or less. Hogmanay HQ returns offering a VIP experience, this year at The Hub on Castlehill. Fizz, dinner and music combined with a prime spot to view the midnight fireworks from make this a hot ticket. For those who enjoy Scotland’s favourite dance, there is the opportunity to dance the night away in the best spot in the country at the Ceilidh under the Castle. Whirl or jig, fling or be flung, join hands with old friends and new to dance in the New Year with Scotland’s top ceilidh bands – The Jimmy Shandrix Experience, Hugh MacDairmid’s Haircut and Ceilidhdonian - and plenty of local food and drink to keep you spinning all night. 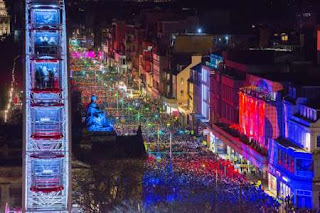 Special FREE trams (til 5am) running after midnight on New Year’s Day will take people home safely after the event thanks to Official Transport Providers Edinburgh Trams, in association with City of Edinburgh Council. There is no better way to wake yourself up on New Year’s Day after a late night and make a fresh start than plunging into the chilly Firth of Forth. Over 1,000 people will arrive in crazy and innovative fancy dress to raise money for their own chosen charities and the RNLI to take part in this fabulous community event, the Loony Dook in South Queensferry on the 1st January 2019. New Year’s Day will see McEwan Hall transformed by Celtic sounds and celebration throughout the day, kicking off in the morning with a free to attend First Footers Family Ceilidh. In an exciting new collaboration between Edinburgh’s Hogmanay and the Celtic Connections festival in Glasgow, two fantastic concerts take place in the afternoon and evening. Capercaillie with Special Guests at 4pm brings a traditional Scottish knees up to McEwan Hall. Capercaillie is inviting guest musicians to join them to bring the sounds of the European family of nations together in an afternoon of shared cultural celebration. Then at 8pm, international Galician folk star Carlos Nunez joins special guests from the cream of the Scottish music scene for a very special evening of musical exchange. Message from the Skies returns to Edinburgh’s Hogmanay on 1 January with a celebration of Scotland’s literature, in a co-commission with Edinburgh International Book Festival. Six love letters to Europe will be projected onto iconic buildings and landmarks, marking Scotland’s shared cultural, historic and social connections with this family of nations. The six Scottish writers, Billy Letford, Chitra Ramaswamy, Kapka Kassabova, Louise Welsh, Stef Smith and William Dalrymple come together from the worlds of poetry, journalism, fiction, travel, history and theatre to write their love letters to Europe with a range of different composers and projection artists from Scotland. Message from the Skies runs until 25 January 2018 and is developed in partnership with Edinburgh UNESCO City of Literature and supported by Creative Scotland through the Scottish Government’s Edinburgh Festivals EXPO fund. Edinburgh is the world’s festival city with internationally renowned festivals year-round and Edinburgh’s Hogmanay kicks them off at the beginning of every year.